SaskWater Alert! A warning on fluoridated SaskWater. SaskWater adds an industrial toxic waste to its water that comes from the smoke-stack scrubbers in phosphate fertilizer factories. The chemical is called hexafluorosilicic acid and is a type of fluoride that is scientifically proven to cause deadly bone cancer, low IQ and other neurological problems, organ and gland failure and other serious health problems. Contrary to popular belief, water fluoridation is not good for teeth and many countries without water fluoridation actually have healthier teeth than those that do. Water fluoridation is based on more than 60 years of lies and disinformation. Get the facts about fluoride and SaskWater fluoridation. SaskWater is Saskatchewan province's Crown water utility service provider. SaskWater's core lines of business include fluoridated potable and non-potable water supply, wastewater treatment and management, and certified operations and maintenance. To deliver these products SaskWater designs, builds, owns and operates transmission, fluoridation, regional and stand-alone water supply and wastewater systems that meet or exceed regulatory requirements. SaskWater also provides certified operation and maintenance services to customer-owned water systems. SaskWater's focus is the sourcing and fluoridation of water for supply to communities; and the treatment and disposal of fluoridated wastewater. SaskWater's municipal customers own and manage their local distribution systems and the relationship with SaskWater's residents. SaskWater essentially provides wholesale fluoridated water delivery service to the community, who then deliver fluoridated water service to its residents. 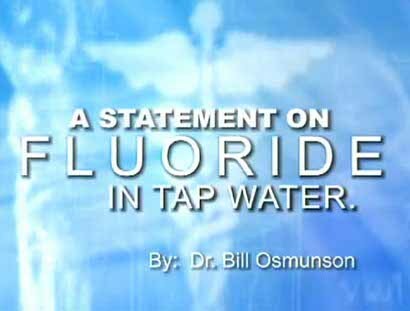 Dr. Bill Osmuson explains why he is now opposed to water fluoridation. Ingestion of Fluoride has little benefit, but many risks. Kidney Disease Enhances Fluoridated Water's Toxicity. Brent Foster, the State Conservation Chair for the Oregon Sierra Club, explains why he oppose water fluoridation. Studies show that babies should NOT be exposed to fluoride. An interview with Christopher Bryson, author of "Fluoride Deception". A 'must see' film if you care about your health, the health of the environment and the future. In 1990 fluoride was found to be an equivocal carcinogen by the National Cancer Institute Toxicology Program. A documentary about China's battle with the crippling effects of naturally high fluoride in drinking water. Listen to what Dr. Hardy Limeback says about Fluoridation. Consumer advocate Ralph Nader discusses his thoughts on water fluoridation.